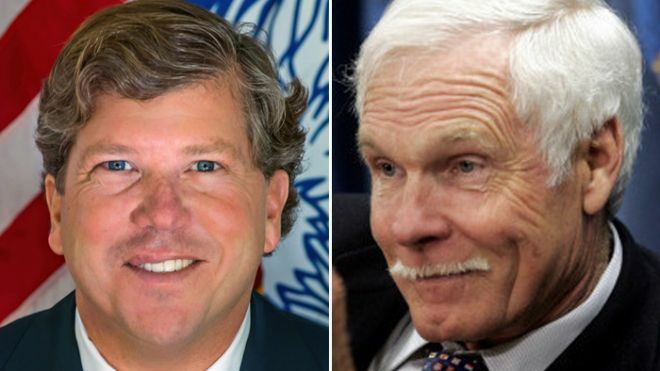 Republican Teddy Turner, the son of media mogul Ted Turner, made news last month when he blamed his father's liberalism on actress Jane Fonda. STEVE MALZBERG, NEWSMAX TV HOST: What do you think when you watch CNN? Do you think they’re down the middle? Do you think they’re to the left? What do you think? TEDDY TURNER: I think they’re pretty much to the left. I don’t think there’s any question about that. It’s not MSNBC, but they’re not Fox. So I think they’re, I have a hard time watching them a lot of times. MALZBERG: And what do you think of the revamping. They got a new guy at the helm now, and they’re adding Chris Cuomo, and they’re keeping apparently Piers Morgan, and it doesn’t seem like this guy is going to do anything to make them let’s say a fairer more balanced presentation. TURNER: Well, they may think that they’re fair and balanced already, or that they said, “Well, let’s give up the fair and balanced and we’ll stay to the left and on that niche." I have no idea what their marketing plan is, and I had discussions years ago with the folks and said, “Listen, you know, the left is not the way to go in talk radio or in talk TV because that’s not who’s listening." MALZBERG: Who’d you talk to years ago at CNN? TURNER: Anybody that would listen. MALZBERG: In any capacity other than Ted Jr.? Did you have any capacity there? TURNER: No, no, I worked on and off for CNN and Turner, you know, kind of all my life. MALZBERG: Right. Did you ever talk to your dad about that while he was still involved? Did you talk to him about it? MALZBERG: And what did he, what was his response when you said it was too far to the left? TURNER: Well, you know, they say that they’re fair and balanced. MALZBERG: Really? So he thought they were fair and balanced? TURNER: Well, he thought they were doing the best they could do. MALZBERG: Alright, and you find it hard to watch. What do you watch on cable news? TURNER: I mostly watch Fox. But I switch around. I think you have to watch a little bit of everybody just to see what’s going on and try to get the real idea of what’s going on…People can have their opinions. If you don’t like it, turn it off and go somewhere else. And I think that’s what’s happening. CNN’s ratings are not great, and I don’t think they’re ever going to get back to where they were.